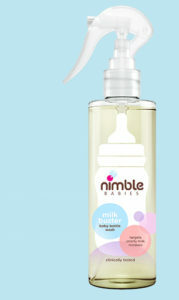 A couple of weeks back we were sent a bottle of Nimble Babies – Milk Buster to try out. I was very interested in this as milk in cups/ beakers/ bottles and this warm weather do not mix. Both my little men love milk and love a beaker of milk before bed. However I find those sippy cups and the bottles hard to get rid of the milk residue smell and hard to get in and get them really clean. One of the great things about this product is the spray nozzle, it means it can reach right into the spout of the beakers/ cups. Its pleasant smelling but not at all overpowering and best of all it works. I used to find depsite hot washes, dishwasher etc they still sometimes had a grimy film on them but certainly not after Nimble Babies. According to Nimble Babies, it is made of the safest cleaning ingredients derived from sugar, amino acids, and coconuts. It’s pH is balanced to be very close to that of water and it also has plant-derived ingredients to remove water hardness. Its also sulphate free too. Once opened it lasts about 2 months so really good value for Stg£5.99. For a full list of stockists see here. There is a great short video on their website to show the product working and explain more about the science behind it.